Back in January, I had the privilege of naming Ryn Weaver to my Class of 2015 project. In case you’re too lazy to click that link, the basic idea is that each year I choose 10 rising artists and closely follow their growth and progress for the next 365 days. My track record is pretty strong, and while nobody will likely ever top the run that Class of 2014 alumnus Sam Smith had last year, a few 2015-ers are holding their own so far. Ryn Weaver is arguably at the top of the pile right now, for a couple different reasons I’ll explain in detail. First, there’s her debut album The Fool. It came out this summer and is a collection of fun, quality pop songs worth checking out if you haven’t already. More importantly, the record proved the hype behind her first single wasn’t a fluke. Her talents extend well beyond “OctaHate” to showcase introspective lyrics and a powerful vocal range that’ll make your eyes widen and jaw drop. Many wise radio programmers have picked up on this, and provided her some strong exposure on Top 40 and Pop stations around the world. That translates to a growing fan base. Second, there’s her live show. 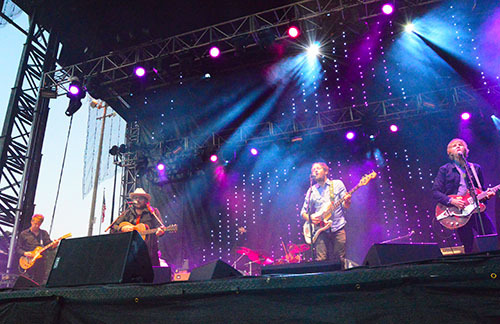 Weaver performed at every major U.S. music festival this summer, including Coachella, Bonnaroo and Lollapalooza. I was fortunate enough to not only catch her set at Lolla, but an additional aftershow she headlined the night before. Yes, she’s got incredible stage presence and knows how to work a crowd. 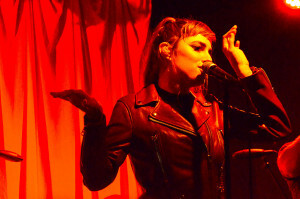 While there’s a certain element of predictability to her set given she has only released an album and an EP so far in her young career, each song takes on a unique and distinctive life apart from the recorded versions in large part because she performs with a full band. That’s unique for someone who makes pop music, where synthetic backing tracks and overdubs are commonplace on stage. She believes that live performances should be fully LIVE, and they’re all the better because of it. Her vocals only get better too, showcasing an elasticity that goes even beyond what you hear on record. Third, she loves her fans. I’ve seen plenty of performers go out of their way to stick around after the show and sell/sign merch, which is always nice even though most of the time they just want to make a sale. When I saw Weaver back in August, she didn’t hang out at the merch booth, but instead greeted adoring fans outside of her tour bus. For over an hour. She not only took the time to sign everything people wanted signed, but she took lots of selfies and had lengthy, genuine conversations that arguably lasted a little too long. It took her about 90 minutes to make it through a line of about 20-25 people, so everyone got a highly personal and engaging experience with her. Not sure I’ve ever seen someone display that level of commitment to fans, which really speaks to the kind of person she is. If you’ll be in Chicago on Thursday, November 12th, you can experience the magic and wonder of Ryn Weaver in person when she plays a show at Park West. It will likely be a wonderful evening, filled with great music and quality opening sets from ASTR and Holychild. The show is all ages and starts at 7, so it should be extra high energy and fun. Tickets are $25 and can be purchased in advance here. Hope to see you there! In my preview for the Hinds / Public Access T.V. 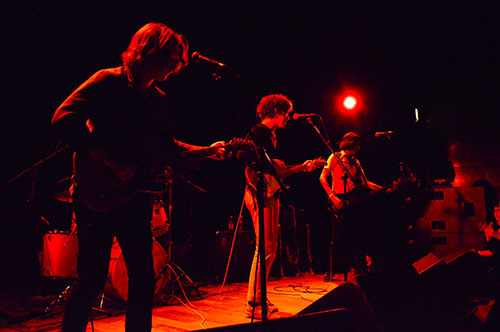 show at Lincoln Hall, I opened with a few remarks on garage rock and how more often than not it tends to have a very gritty, ramshackle-like quality running through every song. A slightly off-key vocal here or a missed chord there is part of the charm. The lack of sheen and perfection also occasionally gives the impression that an implosion could happen at any minute, instilling the music with a precious quality, like something magical was captured that almost didn’t come together. 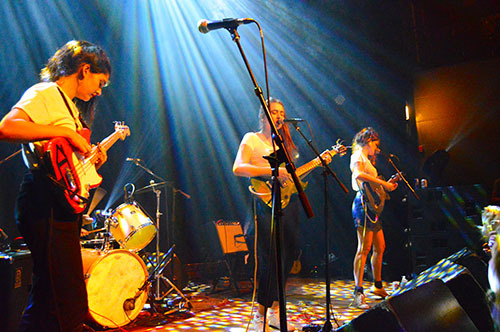 As the crowd at Lincoln Hall found out with sets from the two aforementioned bands on Thursday night, sometimes that sensation extends to live shows too, whether on purpose or completely by accident. Starting the evening was Public Access T.V., a New York-based band formed and fronted by John Eatherly (ex-Be Your Own Pet). They’ve only got a handful of songs that have been released so far, but their sound has certainly evolved in the year or so since they formed. They played all of those tracks at Lincoln Hall, along with a few others destined for inclusion on their debut full length due out in early 2016. What struck me most about their live show was how tight they sounded. 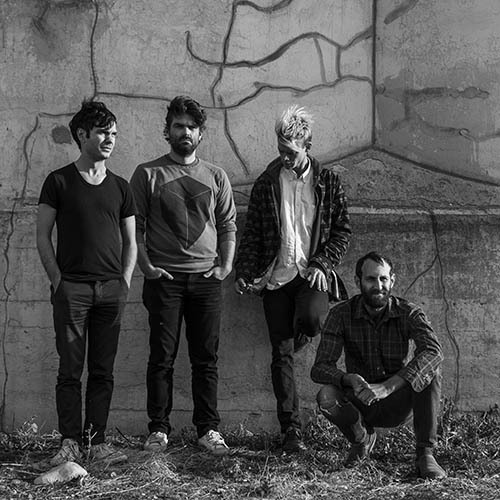 It stood in contrast to the loosely recorded versions of many of their songs, which realistically should have also been messier given their short existence as a band. Many artists take 2+ years to find their stage legs and craft a truly compelling show, so Public Access T.V. are ahead of schedule. Then again, with their members’ past history why wouldn’t they be? Songs like “Monaco” and the recently released “Patti Peru” sounded quite good and were bouncy enough to dance to, which the crowd seemed to embrace for the most part. Most exciting for me however was the unreleased material they played. For a band who’s sound has undergone a significant sonic shift in the last year, these latest steps take things to a whole new level of excellence. An exceptional amount of talent was on display as Eatherly and guitarist Xan Aird both tore up multiple solos that were eerily reminiscent of modern garage heroes like The Strokes and The White Stripes. It was rather exhilarating to watch, even when mixed with some plainer material. Time will tell if Public Access T.V. actually deliver on the promise shown during this Lincoln Hall set, and if fans will embrace them even though there are probably hundreds of other acts trying to earn attention with a very similar aesthetic. One of the main things I know about Hinds is that they like to party. It’s been evident since their inception, and you can hear it in the recorded versions of their songs too. Therefore it only seems fitting that when I first encountered the Madrid band at Lincoln Hall they had cans of Old Style in their hands. As I was standing up against the stage enjoying the opening set, all of a sudden Carlotta, Ana, Ade and Amber appeared right next to me, dancing, laughing and just generally having a great time. They took photos of Public Access T.V., heckled their bassist, and sang along to most of the songs. 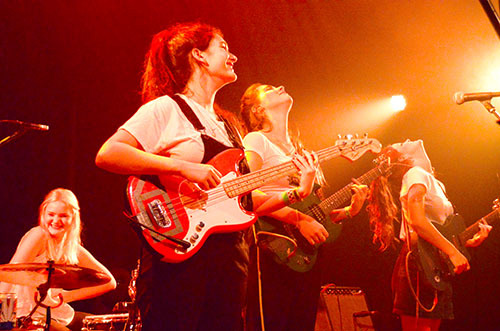 It’s always wonderful when touring bands clearly admire and fully support one another, so all credit to Hinds for refusing to stay backstage and celebrating their openers with the rest of the crowd. When it came time for their headlining set, things suddenly took a turn in an unexpected direction. Opening song “Warning With The Curling” has a fantastic vibe to it complete with complex instrumental flourishes that really give it extra bite, particularly when compared with this early version when Hinds was only a two-piece called Deers. The problem was with the vocals, which started off as non-existent before they were upgraded after a minute to a level that was barely audible. Poor mixing at Lincoln Hall rarely if ever happens, so I’m not sure if someone was asleep at the sound board or the band purposely requested the vocals at that level, but either way I could tell that something was off from the start. The issues multiplied when after two songs the band was forced to put the show on hold because a string on one of Carlotta’s guitars broke. They asked John Eatherly of Public Access T.V. to come up and re-string it for her, which he kindly did. Considering that last year I witnessed a member of the band Blank Range re-string his guitar mid-song without missing a single note, this was a little disappointing by comparison. Still, broken strings happen to every band, and there’s not much you can do about them unless you’ve got a guitar tech/roadie working for you behind the scenes. So bad sound and a broken string struck during the first 10 minutes, and thankfully things didn’t get worse from there. Despite being largely a collection of accidents, errors and alcohol-fueled terrors, there was something irrevocably charming about Hinds. Call it stage presence or generally mischievous attitudes, but when you throw heaps of personality on top of a dozen very good or great songs, a certain amount of leeway is given that both the band and crowd fully acknowledge. No matter how often things went wrong, everyone on stage and off was smiling and having a great time. The cheers were loud and passionate. At one point during “Chili Town” somebody climbed on stage and then crowd surfed just for the hell of it. 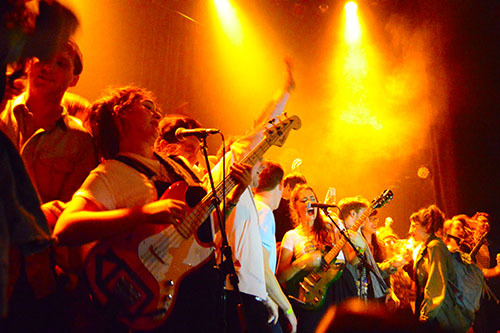 When it came time for the encore, the band invited everyone to join them on stage for their cover of Thee Headcoatees’ “Davey Crockett,” despite the protests of Lincoln Hall security and management. Halfway through the song somebody stepped on a cord and unplugged Ana’s guitar. They paused for 20 seconds while she plugged it back in, and then picked up right where they left off with everyone singing and dancing along. It was the perfect way to end a gloriously imperfect night. With the rain completely out of the forecast and temperatures dipping back into the 80s, things were certainly looking up for Sunday at Pitchfork. Just about all of the muddy spots in Union Park from Saturday’s storm were now cleverly covered up with some quick dry solution and a whole bunch of carpet square samples. One of the big product placements over the weekend was a company freely handing out recycled carpet squares so people could sit on the ground without getting their pants dirty. I doubt becoming patchwork quilts atop mud pits was their original intention, but at least it was functional and made walking around easier. There was plenty of great music to watch as well, so join me after the jump for a recap of the third and final day at Pitchfork Music Festival. If you’re attending all three days of this year’s Pitchfork Music Festival and are anything like me, by the time Sunday rolls around you’ll wake up even though your body will definitely not want to. The thought that you’ll have to spend another full day standing around will seem like the worst idea in the world. Take an extra hour to rest if you must, but then you’ve got to push through and get moving, because music waits for no human. Which brings me to a couple of quick tips on surviving your weekend at Pitchfork without winding up in a medical tent or the hospital. Priority one is hydration. It’s going to be hot outside, and you’ll be standing on your feet for extended periods of time, so do yourself a favor and drink plenty of water. Save the majority of your alcohol consumption for the early evening hours when it starts to cool down. The next tip is to sit and find shade whenever possible. Yes, you want to see as many artists as up close and personal as possible, but don’t put your body at risk any more than you feel you have to. You know your limits, so be sure to keep close attention on how you’re feeling and rest when and where you can. You’ll still be able to hear the music while seated under some shady trees, even if it’s across the big field in Union Park. Wear sunscreen and bug spray. You know why, and will pay the price for forgetting. Lastly, be prepared for weather. I’ve already mentioned the heat, but currently the forecast is suggesting scattered storms pretty much the entire weekend. Definitely don’t forget a poncho, and consider an umbrella too even though you’ll likely annoy fellow fest-goers if you leave it up while standing close to a stage. Also, mud. If it rains, Union Park will turn into a large mud pit, so wear appropriate shoes you’re okay with potentially trashing at the end of the weekend. So that pretty much wraps up my Pitchfork tips. Join me after the jump for the Sunday Preview Guide! If you missed my previous Pitchfork Music Festival 2015 posts, go here to hear/see/download songs from every artist on this year’s lineup. If you’ll be at Union Park on Friday, you may want to look over my preview guide for that day by going here. Last but not least, go here for my preview guide for Saturday. As we continue Pitchfork Music Festival Week here at Faronheit, it’s always a pleasure to offer a closer, more in depth look at not only the artists on the lineup, but some analysis as to the scheduling so you can make the most of your weekend. There are always inevitable conflicts with artists you might like to see, as well as times when it might feel like a dead zone where there’s nothing to interest or inspire you. Fear not! There’s plenty of fun to be had every hour the gates of Union Park are open, whether you know it or not. Sure, there may be some tough calls to make at times, but one of the best things about Pitchfork is that there are never more than two stages going at once. They’re also not that far from one another, meaning that if you really want to see pieces of different sets, it’ll be a five minute walk to pull it off. Minimum effort for maximum musical reward. So without further ado, please join me after the jump for an hour-by-hour look at what Day 1 (Friday) has to offer. If you missed yesterday’s post featuring audio and video streams/downloads from every artist on this year’s lineup, you can find that post right here. Welcome once again to Pitchfork Music Festival Week here on Faronheit! Each year, I’m proud to provide extensive coverage of the Pitchfork Music Festival in the form of previews, recaps, photos and much more. 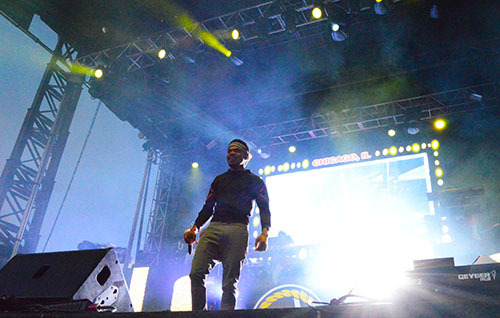 It’s all part of a grand plan to ensure you’re fully prepared for all of the must-sees and must-dos at Union Park this weekend, or to at least give you a strong idea of exactly what went down if you can’t be there in person. For those unable to attend, either due to geographic location, financial issues, previously scheduled engagements or inability to buy tickets (only Friday tickets remain), I sincerely hope you’ll follow along this week to hear about all the gritty details. As it is every year, the lineup for the 2015 Pitchfork Music Festival is stacked with a who’s who of indie talent, along with a whole bunch of new and rising artists on their way to stardom. I’ll have plenty of details in the coming days surrounding who you shouldn’t miss each day and when they’re performing, but for today I hope you’ll take some time to explore and learn more about the lineup on your own. All of the resources you need to do so can be found right past the jump. Stream and download some songs. Watch some music videos. Visit some websites. This is an interactive journey, and I have high hopes you’ll make some fun and interesting discoveries as a result. There are clickable Soundcloud, YouTube and other links for every artist in alphabetical order by day. If you’re a Spotify user, you’ll also find a 92-song playlist (organized by set time) embedded at the very bottom of this post for your convenience. It contains a lot of the same material you’ll find below, only you won’t have to click as much. So there you have it, please enjoy responsibly. Starting on Tuesday there will be day-by-day previews leading up to the start of the festival on Friday, so keep checking back as we progress throughout the week! It seems like I say this every year, but there’s absolutely no way that the Class of 2015 will be able to top the Class of 2014 in terms of overall success. If you’re looking at statistics and equations, it’s pretty much a mathematical impossibility. And you know what? That’s perfectly okay. In fact, I’ve gone out of my way to select artists for this year’s class who will probably not catapult to the top of the charts and get nominated for copious amounts of Grammys. It’s never been a popularity contest, even if some of the artists have become massively popular anyways. The goal of the “Class of…” project is to shine a light onto bands and musicians who are deserving and likely to receive strong raises in their profiles over the course of any given calendar year. The expectation is that they have the talent and promise to do great things, of course whether or not they actually accomplish them is another matter entirely, as a few have turned out to be duds or late bloomers. Either way, all of the 10 artists named are kept under careful watch by yours truly, and you’ll be able to find out about their latest and greatest happenings for the next 12 months right here on the site with periodic updates as to their progress. I’m tremendously excited to reveal the Class of 2015 below. While the goal is to offer up a diverse array of talents across many different genres, I couldn’t help but notice a small theme with a majority of this year’s class. Should projections prove true, 2015 will be a big year for 70’s style folk singer-songwriters. If David Bowie’s glam rock era helped define 2014’s main sound, the intimate and personal songs of Nick Drake and Harry Nilsson may be where we’re headed next. I mean, if Sufjan Stevens can pop his head up from wherever he’s been hiding to announce a new album that’s a “return to his folk roots,” then like the groundhog it must be a signal of things to come. Rest assured though that everything below is not exclusively for bedroom headphone listening. So without further ado, let’s jump right in and meet the Class of 2015!